Tahoe Forest Hospice is a licensed and Medicare certified program serving patients in the Truckee/Tahoe area, Incline Village and Plumas and Sierra Counties including Calpine, Graeagle, Portola, Floriston, Verdi, Sierraville, Loyalton, Soda Springs, and Emigrant Gap. Expertise in comfort care assures the patient state-of-the-art pain control and symptom management. Our healthcare team works cooperatively with the patient, family and the primary physician to provide customized care. Hospice staff are available 24 hours a day, 7 days a week. Hospice enables patients to focus on living their remaining days at home, among family and friends. Hospice offers patients support not only for physical symptoms, but for emotional, social and spiritual needs as well. This support extends to family and friends as hospice can help them cope with their own unique emotional and spiritual concerns during a difficult time. 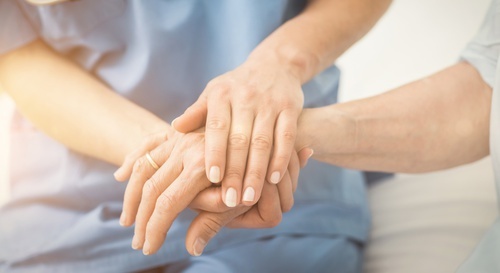 Any individual who has been diagnosed with a terminal illness who does not wish to seek curative treatment should consider the benefits of hospice. Patients are accepted into the program on the basis of their health needs, not their ability to pay. Hospice Services are available to patients of any age, religion, race, or illness. When the goal of treatment begins to shift from curing the illness to providing comfort, it is time to consider hospice. Hospice can help the patient and their family understand their options and choose the path that will help the patient maintain dignity and quality of life at the end of life. Hospice is a concept of care, rather than a specific place. Hospice care takes place wherever the patient calls home; a house, a hospital, nursing home, or a long term care facility. Hospice assists with daily activities and everyday personal care, as well as comfort care. Family care-givers benefit from Hospice support as caring for your loved one may be overwhelming or physically challenging to handle alone. Comfort care focuses on pain control and symptom management to ensure the patient is comfortable. This care is customized for the individual patient, helping patients maintain the highest level of function while honoring their unique circumstances and preferences. Through one-on-one counseling, support groups and other special services, Hospice is committed to assisting families and loved ones work through the grieving process. Adjusting to life without a loved one takes time, and a variety of support services are available. For more information, please call 582-3534.